Bad guy: You've got no place to run. Prepare to die!Kaine Blueriver: That's my line. 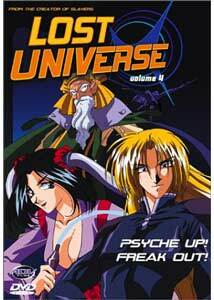 With disc four of Lost Universe, the tone of the series takes a serious turn as the main story arc gets well under way. With our principle characters fairly well defined, their opponents become more of the focus while the conflict the crew of the Swordbreaker will face is exposed. We get a couple of character pieces and a pair of self-contained contracts that also flesh out background. Roy Glen, who has until now been seen sporadically trying to instigate Kain's downfall, gets a bit more coverage, as does Kali, the light whip-equipped fighter who Kain has yet to best. The entrance of Dark Seeder adds a new element to the story, as age-old conflicts are renewed again. It's a time of reaquaintance as the Swordbreaker crew head back to Kain's former home to visit his grandmother, but someone else makes an unwelcome appearance as well. Kain's past and the history of Swordbreaker begins to be told, as a new villain enters the picture in the form of Dark Seeder. Kain's encounter with Dark Seeder will have long-lasting effects on the caped Trouble Consultant, as his fate and that of his Lost Ship becomes more clear.In Fear Whispers, Kain meets up with an old Trouble Consultant partner whom he hasn't seen since an unfortunate on-the-job accident three years prior. Atlas hasn't been the same since; once a role model, he can't even hold a job together now. With Kain's reappearance, Atlas is determined to complete the task that was his undoing—saving an aging power plant from a sea of acid—but is the job still too much for the two of them?The Gazer Concern is becoming critical of Roy Glen's attempts to bring down Kain and capture his Lost Ship, but his plans have been in play for a long time, with only one final move to complete them. He calls in the assistance of Kali and, dangles an opportunity to reckon with Kain as bait. Meanwhile, Millie is busy infiltrating a company that has developed a new teleportation technology that can effectively bypass their ship's security. It is a race against time to make sure the device doesn't fall into the wrong hands and jeopardize Swordbreaker, indefensible against it, as Nightmare Appears.It's shopping time back on Millie's home world, and time to stock up on weaponry, but resources are limited. A rift is formed when Kain is resistent to what Millie Desires; an old cannon for the ship. Elsewhere, at the Universal Guardian headquarters, a traitor has been discovered; secrets are leaked to outside forces, and the hunt is on to find the perpetrator.The series continues to entertain, but I would have preferred the comedic elements to have been more frequent, especially with the introduction so far. While the depth of the overall plot is increasing, the mood has changed. We get a better appreciation for where everything is headed, and while some of the pieces are falling into place, there are still a large number of mysteries yet to be unravelled. Image Transfer Review: Transfer quality is consistent with the earlier discs in the series. Colors are fairly strong, blacks look good, and grain is present but not too intrusive except in dark blues. There is some typical aliasing, and a few color shifts here and there, but nothing major. A good, but not outstanding presentation, on par with other discs of this era. Audio Transfer Review: Audio is consistent with previous installments, clean for the most part, with a bit of edginess in some louder dialogue. The stereo field is appropriately utilized, and frequency coverage is average for a TV series. The English dub is a complete rewrite, so you are really getting two slants to the story here. Extras Review: Front loaded, but skippable trailers include Farscape, Shadow Raiders, Orphen, Arc The Lad, A.D. Police and the ADV mix trailer. Like the previous discs, the main menu also allows access to the trailer reel, then chapter skip to the individual titles. Static menus have different animated transitions than the first three discs. The series continues to be enjoyable, but I felt the downplaying of the comedic elements was a bit abrupt, as this was one of the draws from the get go. There is still some degree of silliness, but the overall feel has changed, and we are definitely heading towards more of a continuing story from here on out.